Talk: My life in the digital world _ Mathias Vestergaard Corp. 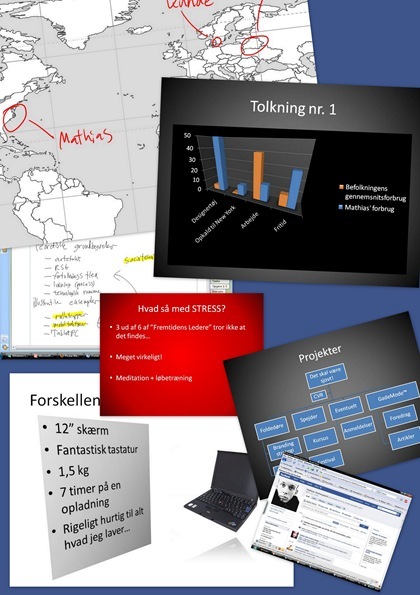 Yesterday, on Wednesday October 1st, I gave a very short speech at a conference organized by IT Forum Midtjylland. The theme of the conference was “living in a digital world” and the other speakers included the likes of Marc Prensky and Anne Lise Kjaer. My speech was intended to give a real life example of the theories presented by Prensky and Kjaer, so I talked about my daily life. My addiction to Outlook, my 12″, 3 pound office (a ThinkPad x60s) that I use to get around, how I manage projects for clients in Copenhagen, with developers in Minsk and me sitting around in New York. I talked about how I don’t distinguish between work and play – about meditation and stress (and how leaders often talk about it as something that doesn’t exist). Finally I talked about my projects and how I manage my digital online identity. Before I knew it, my 8 mins were up and it was time for a coffee break. You can download my presentation (including my notes) here. This entry was filed under IT - Information Technology, New York, Talks, Urbanism.